Spencer Weir-Daley hit a hat-trick as Kettering Town’s fine away form continued with a five-star show as they inflicted a 5-1 hammering on St Neots Town. The Poppies are still waiting for a first win at Latimer Park this season but they picked up fifth victory on the road in six outings in emphatic style. Marcus Law handed goalkeeper Paul White his debut while another new signing, Lewis Hornby, was named on the bench. Dom Langdon was restored to the starting line-up with Kaid Mohamed dropping to the bench but there was no place in the squad for Aaron O’Connor. The Poppies were in dominant form during the first half as they raced into a 3-0 lead. James Brighton struck the post early on before Brett Solkhon headed wide. 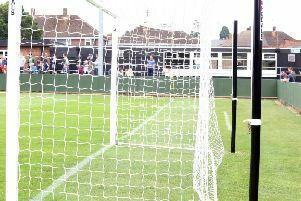 But they did open the scoring when Weir-Daley seized on a mistake from home goalkeeper Alex Archer before finding the empty net. Weir-Daley had another effort ruled out for offside and then the Poppies hit the post for the second time with Rene Howe the unlucky one on that occasion. But they did score two more before the break with Nathan Hicks grabbing the second with a shot into the far corner and then Weir-Daley struck his second of the game after a fine touch and then lay-off from Howe. St Neots improved after the break and they pulled a goal back when Ryan Hawkins’ shot took a deflection and looped over White. But it was Kettering who had the final say. Weir-Daley completed his hat-trick after good work from Wilson Carvalho and Carvalho himself rounded off the scoring with a tap-in late on. It means the Poppies are now unbeaten in four matches in all competitions as they begin their preparations for Saturday’s FA Cup second qualifying round clash at Rushall Olympic. These are the 12 most targeted streets in Kettering for burglaries in 2019 according to police - how does your area compare?